For any electronic device, whether it's trendy or not, should we really care? It's what we do with it that counts. Now, does the electronic device fulfills my needs? That's another story. I think the device called a camera should be redesigned from scratch. The 3 parameters of the exposure triangle: shutter speed, ISO and aperture are the very basis, hence they should each deserve a dedicated dial. Add to that an exposure compensation dial, MSAP dial, a fair amount of megapixels, a good dynamic range a hot shoe and I'm good. Now wait a minute, it sounds pretty much like the Nikon DF... I just wished they could have increased the dynamic range, raised the resolution to at least 24Mp and have a decent price. Nikon just made my life easier. At that price, no question, I'm keeping my money and I'll keep dusting off my D600 sensor every now and then for a while. This camera, that camera, wrong with photography, good for photography. Whats wrong with you all?! Seems to me a lot people cannot cope with the fact that their jobs/skills/art is being equaled to those holding iphone. Sorry, photography has become commodity just like any other profession out there. I'm not a photographer, I'm a software engineer. But I enjoy photography because it gives me an outlet and if I make some money out of that, all the better. In my line of work google and apple ruined everything; API this, API that, just do this and that. A lot of chatter out there about lost art/skill. I see computers nothing but a tool. You guys (on this site) think iPhone can do this while Android can do that. In reality - its all damn software and phones are now just computers. So the same goes for cameras. A camera is a tool which enables you to make a living in your line of work. Thats the bottom line. If you don't like the bottom line, change your thinking and you won't be writing articles as to which camera is good or bad because it doesn't matter. Digital vs. film, endless debate. Shut the hell up! I have Fuji x100 because I like the way it looks, to me its pleasing, useful, and damn fun to turn those dials to what I need. I guess I'll get the same thrill from this new Nikon Df. I also have Nikon d7000 and love it. Its a great tool which enables me to take great shots of what I want when I want and I can rely on it 100% percent not fail. Alas, I don't get the same thrill from turning its little knobs or pushing its buttons and its aesthetics, they are just fine. My favorite is using old yashica mat. Loading the film, guessing exposure (don't you just love it when you get it spot on) and dialing in those knobs. Looking into viewfinder and taking that shot is nothing but pleasure. It doesn't make my photos better (worse even). But its pure joy to use it. I wish I had more time to join in photo session and do a nice studio shoot with it. buy yourself a nikon fa or f3hp and scan it with your everyday camera.... WTF ????? I don't see how this camera is any less trendy than the Fuji x100 or x pro 1, both of which are highly sought after despite several shortcomings. 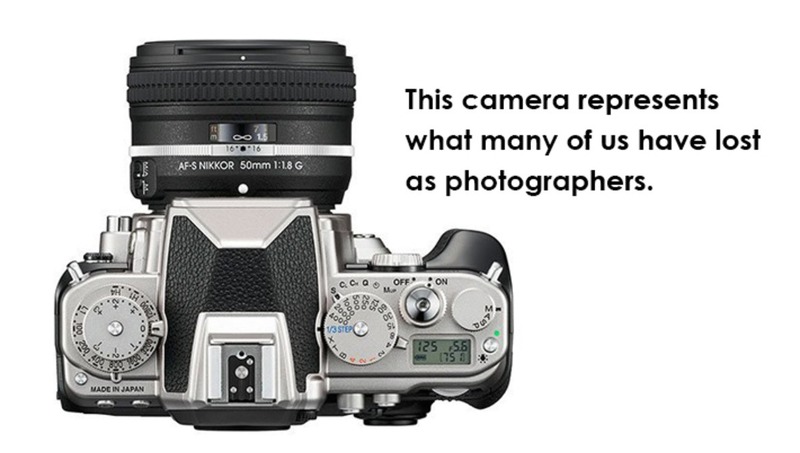 I see this as Nikon allowing us Nikon shooters to enjoy some retro simplicity in a scaled down body. Since I have a pile of Nikon glass I can stop thinking about the Xpro1. Well done Nikon. It's so weird, the fervent reactions this camera elicits, both pro and con. Nikon's to blame, to some extent, with the way they hyped it up and the breathless sloganeering that was used in the tease campaign. That said, ultimately, the DF is a really simple proposition: it's a great camera for people who want a full-frame digital SLR that is smaller than current full-frame D-SLRs, with dedicated manual controls for all essential settings, native compatibility with Nikon F-mount, and maximum compatibility with very old Nikon F-mount glass...and willingness to pay almost $3K for such a camera. I see it as a sort of Special Project for Loyal Nikonians, who have built up an arsenal of Nikkor glass over decades, and who want to use those lenses without a crop factor and with the sort of exposure controls they had when they bought those old lenses new. It shouldn't appeal to more than a very few of us, but just because it's a niche camera doesn't mean it's now the vanguard of some sort of Retro for the Sake of Cosmetics trend. In fact, because it's priced and designed to be a niche camera, it's *not* the vanguard of that trend, to the extent that trend even exists. A slightly different take. I shoot primarily editorial for magazines. Typically portraits, lifestyle, bands and events in almost any lighting situation. Often without time to set up the lighting I like. 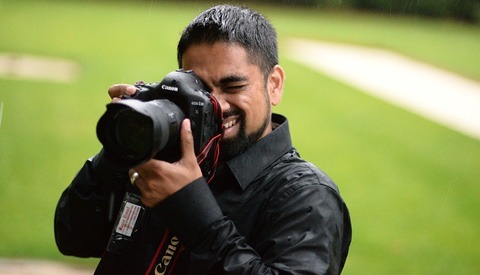 My workhorse is a D700 - tough, dependable and good (not great by today's cameras) low light capability. Obviously my perfect camera would be a D3s/D4..but they are just out of reach financially. As I see the Df it is an almost perfect fit for me. ISO12,800, D4 sensor, the ability to use almost any lens and even more importantly at events the quieter shutter operation. THe looks, yes, absolutely love them, and at the price of a used D3 I'm willing to give up a little in operational ergonomics in return for a camera able to do what I need it to do. My other thought on that is the same reason Zach Arias gave for shooting most of his work with the Fuji - to stand out and be remembered in front of clients. SOmething different than everyone else is using, marketing form over function, however as stated this pretty much fits all my needs. What I don't like is that they didn't do anything innovative. They took all their old technology and put it on a new body. It's just a camera to appeal to the nostalgic to make money. It's not so people can experience photography in a new light. When has marketing ever been truth? The first rule of marketing is to create a craving. Their has to be a reason that people should buy it. Look past it and see that it's a hodgepodge of Nikon camera hardware put in a retro looking body. I recently bought a $50 plastic Holga for a bit of fun and to get back to basics without ANY buttons other than dials for bright, dull, close, near and far! After shooting seriously with a D4 for a day job, I have to say that I really enjoyed shooting so simply with Holga. No need to spend $3000 on a Df and I got some genuine excitement when I got the negative strips back with a digital scan of the negatives all for $17 each roll. I am sure that the Df will take nice images and have enough features for the nostalgic shooters with deep pockets, but it just seems like a clever marketing idea and a camera stuck in no mans land. Too much competition in point and shoot land for the price point of the Df. You don't realize how accurately you've just described the Df's creative approach LOL! The old cameras are great because you learned what you could do without any help. It made you better because you weren't a slave to the "dummy" settings. I just don't understand why they can't make a bare bones manual digital camera with a large sensor. They could sell it at a decent price point, you know for students and people who actually want to learn photography. Maybe one day we'll actually even get cameras that we can upgrade. Want a new sensor, pop in a new one. They could even sell upgrade packs with different hardware and firmware upgrades. It almost seems like a sustaining business model to me. Or maybe I just have too high of hopes. No one will write about the DF 30 years from now saying this was my first camera. Lets face it its to much to be a first camera that someone will look back on. Tell me this in 1971 did you see Nikon building a Rolleiflex type box camera and charging double the entry level cause its schick. Nikon would have won with this camera if they kept it at 400 or lower. Giving a entry level camera moms and dads would buy newly weds and college kids to take those first shots. LOL so in other words spend $3,000 because it's going to let us enjoy the Df in an “inspires me to love my craft again” sort of way. That's ridiculous. Less Features then the D610, but more expensive, and they make it appear as this was a good thing.. If someone wants to pay 600$ more for the design, ok, that's their choise! Hey Nikon! I have an idea... FIX THE FOCUS ISSUES OF THE D800 and D800E before you worry about making more TOYS. 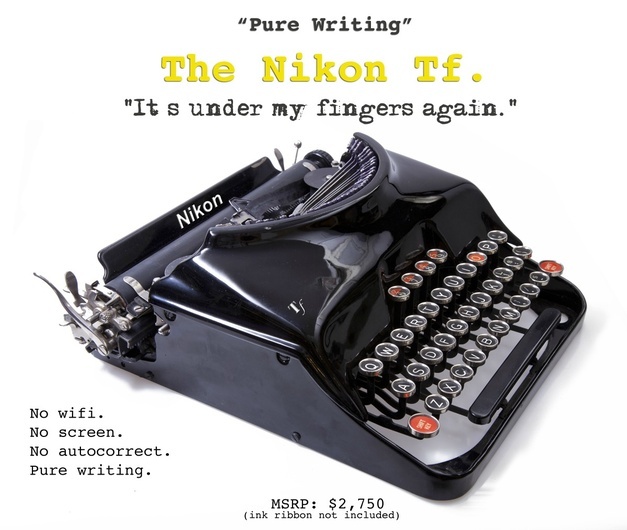 Having used Nikons for 38 years, why would I want a $3,000 Nikon FM? You could have at least picked one of the PROFESSIONAL Nikon Bodies, like the F2 or F2A or F3HP or F4, but A NIKON FM? Err... or FE? And Nikon wonders why so many dedicated Nikon uses are moving to Canon... IT'S NO MYSTERY TO ME! I think we all forget that Nikon is a corporation whose primary purpose is to maximize profits. This camera is profit maximization at its best. A dated processor and sensor no built in Wifi or GPS, 1/4000. In a lovely body. I would not be surprised to see a gold version. 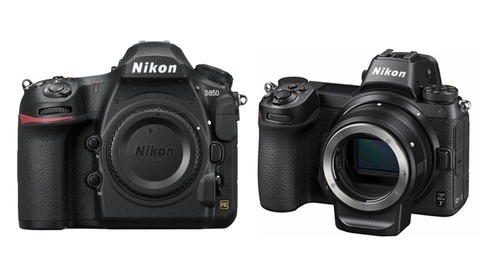 Could you imagine this with the D800e sensor or even the D4 sensor with no AA filter. Even the "new" 50mm lens is a profit maximizer for nikon. Buying an older film Nikon that looks like this, would be a "FULL FRAME" and cheaper, and you'd be able to use the older lenses too. Geez, if you like the camera, you have the money, by all means get one. If you dont like the camera and dont have the money, just shut up and wait for the next new camera. 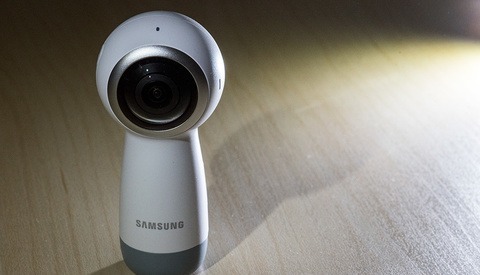 A practical thought, if no one will buy, nobody will make these kind of cameras. They're corporate, they will always give the illusion they care, but they only want our money. ...oh and, i'll ill be purchasing one. Sorry, but as much as what Nikon calls this camera is, I still cant believe that for a camera focused with legacy lenses and the whole photography experience, it doesn't come with any innovation for the optical viewfinder, I was expecting some kind of HUD or a modern day form of digital split-image focusing (ala what Fuji demonstrated), heck there's not even split-image focusing screen option available. I don't mind that it doesnt have video, or that it has too many buttons, but I don't see the point of promoting the use of very old legacy lenses when there's nothing to help these old lenses to focus as well as film days or new tools to aid in focusing.